The early summer garden looks fresh and colorful – your spring work is paying off. Your flower garden is growing vigorously. (If Mother Nature has co-operated with enough rain – she doesn’t aways.) 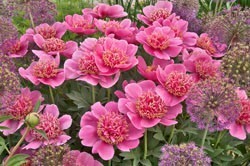 Early summer flowers such as roses and peonies and irises are in bloom. Trim or shear deciduous or evergreen hedges. 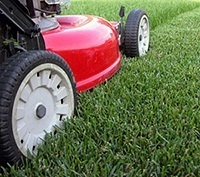 Mow your lawn as often as needed, but don’t cut it too short – never remove more than one third of the grass blades at a one time. When your lawn is growing vigorously, it’s better to mow it every four or five days than to wait a week. More lawn care tips. Keep weeding. Easy to say, but hard to do sometimes! See these weeding tips. Learn about controlling dandelions. Water your plants as needed, especially newly planted trees and shrubs and perennials. They need a good soaking every week in their first couple of months. If it doesn’t rain enough, you will need to make up for that. More on good watering practices. Inspect your plants. Keep an eye out for insect and disease problems. Deadhead rhododendrons and lilacs and prune spring-flowering shrubs that have finished blooming. More information on pruning. Deadhead annuals, roses, and perennials to groom the early summer garden and encourage repeat blooming. More on deadheading. Spray roses every week with a fungicide or baking soda solution to protect against black spot disease. To make your own fungicide spray, dissolve 1 to 2 teaspoon of baking soda with a few drops of dish-soap in half a gallon (2 liters) of water. Pinch back asters and mums to encourage compact growth and more blooms. Inspect bearded iris foliage for signs of iris borers. Cut down yellowing bulb leaves See bulb care after flowering. Note bare spots in the garden that could use spring bulbs, and decide which bulbs would be most suitable. For ideas, see spring bulb guide.